If you ever need a desktop or travel hookah, then look no further than Oduman Hookahs. Specializing in an uncommon combination, Oduman combines the modernity of glass hookahs with high quality stainless steel ports and downstems. While the Mini Tank glass hookah is small in stature, measuring 7.5" tall, it will produce some phenomenal smoke clouds during your session. Speaking of stability, the simple, rectangular design of this hookah makes it one of the most stable hookahs that we carry. No wobbling stems, no uneven bases, just a perfectly stable hookah. The Mini Tank comes equipped with a built in diffuser to keep the classic hookah "rumble" to a minimum. If you've ever been annoyed that a hookah bubbling is getting in the way of your favorite TV show or work flow, then worry no more! This diffuser can also be removed with just a couple of twists. For added freshness, the Mini Tank includes a washable hookah hose that can easily be cleaned to get all those pesky shisha tobacco flavors from your last session out of your hose. Last but not least, this hookah comes travel ready with an included carrying bag to hold your hookah and accessories, allowing those thick clouds to travel with you! 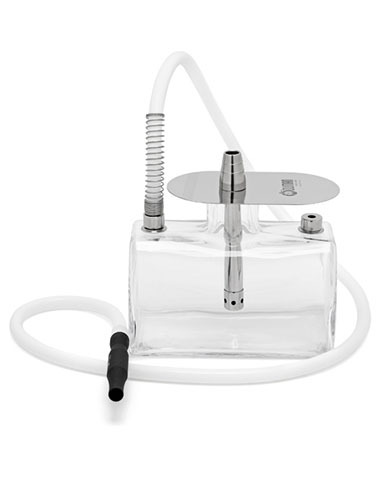 Oduman Mini Tank Glass Hookah has a average rating of 0 stars out of 5 stars based on 0 reviews.